Regarding Dave Kellogg's question, one of our main problems with stdio functions is that they tend to be written for efficiency which is not a bad thing, but with little or no regard for safety (our concern) or even decent coding. The tinyprintf he references is as bad. It looks like classic C write-only code. Cryptic, no comments and basically unsupportable. I have attached our in-house version that we use for safety-critical testing. [Available here]. It is heavily modified from the original source, but now supports long, long long, and hex mode. It does still use stdarg.h features, which is a violation of Rule 17.1, so it still isn't fully MISRA compliant. Then again, we don't intend it for application use, but it could be modified easier than tinyprintf. The varargs are a whole other issue though. 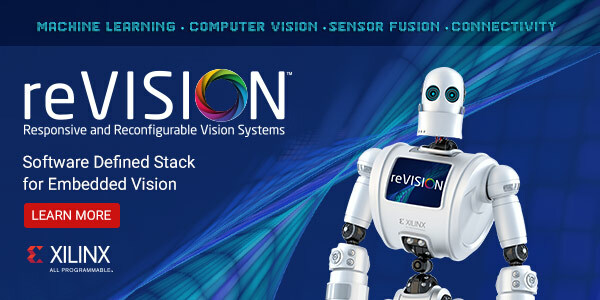 They are usually very compiler implementation dependent and thus are difficult to universally replace if you use lots of tools and processors. It's licensed as public domain. One of the things I really like about it is that you can pass in an output function. This means that you can easily direct your output to an LCD or a serial port, etc without having to print into a temporary buffer first. By putting all the functions in a library, I only link what I call into the app. If you then move the '4' and '5' 1 byte to the right and stick a '.' in buf, you're done! Just wanted to reply to the question from Dave Kellogg on the latest Muse. Doing that does significantly bloat up the size of the target binary, however. Quick response to Dave Kellogg's question about stdio: I don't use it at all, mostly to help with aerospace regulations on top of MISRA. On the rare occasion I need to format text, I write some trivial code to output a string or an int. You could use stdio for debugging, where rich I/O is useful, then remove it for production. Also, with embedded systems, there's usually some other tool (e.g. a PC) in-between the system and the user, so you can do I/O in raw binary and write PC-based tools to provide pretty formatting and display. In a recent commercial project I had to add an UART function to an already defined system. The micro provided an UART, but the pinout of the chip prevented access. I had an 10kHz timer based interrupt running. So I made an bit banging send-only UART inside this interrupt routine with some help from the main loop. 10kHz is near enough to 9600 Baud, so you can set the receiver (hardware) UART to 9600 Baud if you leave enough blank bits in between the sent bytes. The interrupt outputs per call one bit of a (for example) 64 byte array, iterating through all 512 bits. 16 bits (two bytes) are used as one byte to be sent. The main loop does setup this array every 512 interrupts with all the required start, data, stop and blank bits. This way the cpu load inside the interrupt is minimized. For serious work I only ever do builds with -Werror, -Wall, and -Wextra turned on (-Wextra is a pet peeve of mine -- in Gnu-land, -Wall doesn't, in fact, warn on absolutely everything that the compiler knows to warn about, which leaves me grumbling about the definition of the word "all"). If you write your C or C++ code with the kind of paranoid good style that avoids the dark edges of the standard, you'll never light up the warnings, which is the whole point of turning them on. In 1985 Intel came out with the 386 processor, which had an on-board memory management unit. Most developers programmed it to give a flat 32 GB address space. At the time - and in the 32 years since - I thought the MMU was a huge gift to developers. It gave us a way to make software that was more robust and secure. Alas, the microcontroller space really hasn't had that sort of resource till recently, when ARM came out with their memory protection unit (MPU). In my opinion, the MPU is a boon to developers, one that is still too underutilized. Ralph Moore has been writing about using it. 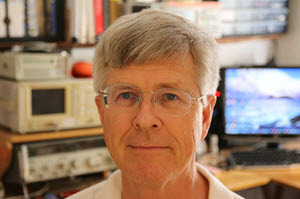 Here's Ralph Moore's third and final installment about using the Cortex-M MPU. Part 1 is here and part 2 here. As I noted in my previous blogs, "Working With the Cortex-M MPU" and "MPU Multitasking", embedded systems are being drawn into the IoT and thus security in the form of protection of critical system resources is becoming increasingly important. The previous blogs discussed how to define MPU regions and Memory Protection Array (MPA) templates using the regions and then how these are used to enable MPU operation in a multitasking environment. The resulting MPU format and a step-by-step procedure to convert existing software to MPU protection is the subject of this blog. This seems to be a good format for the MPU. The top two regions contain the Main Stack and code for handlers and ISRs, respectively. These are privileged regions that are present for all tasks. The shaded regions correspond to Memory Protection Arrays (MPAs) that are loaded when tasks are dispatched. An MPA may be unique to a task or may be shared between a group of tasks. MPAs apply to both privileged tasks (ptasks) and unprivileged tasks (utasks). 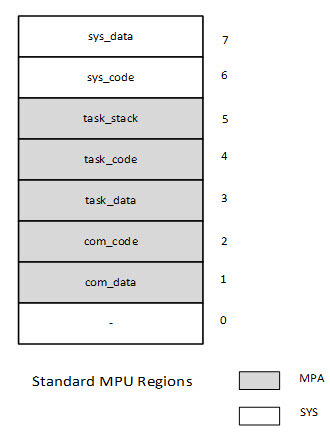 The bottom region (0) is available for a system region, such as an RO region for C libraries, tables, and text strings, or it could be added to the MPA if more regions are needed for tasks. In the event of a region overlap, the higher number region's attributes prevail. 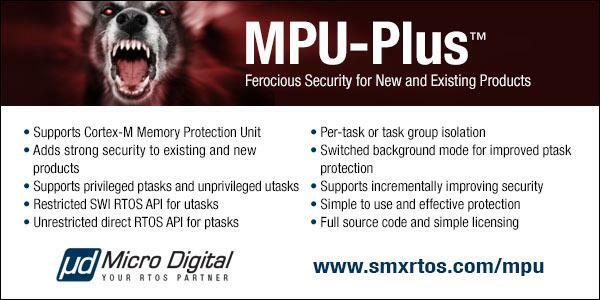 To start, it is assumed that the RTOS library includes the MPU-Plus™ files. Add a call to sb_MPUInit() near the beginning of the startup code and temporarily disable loading MPU &  in it. This turns on the MPU and enables its Background Region (BR). The application should run normally with these changes. A significant gain has been made at this point: handlers and ISRs are running, as they were before, but all or most tasks are running in reduced memory regions with strictly controlled attributes (e.g. RO, XN, etc.) This is likely to reveal latent errors. In addition, significant spare memory, if present, has been protected from access by wild pointers and malware,. The first step is to group code and data into task-specific regions and to define blocks in the linker command file to hold these regions. The linker can pull together parts of regions from different modules so that code and data reorganization is not necessary, though perhaps desirable. It is convenient to name a task's regions after the task, e.g. : taskA_code and taskA_data. ahead of the task's code. This forces the SWI API to be used for RTOS service calls and other system service calls rather than direct calls, as in pmode. At this point, it is probably desirable to pull all of taskA's code together into a single module since xapiu.h applies to all code that follows the point where it is included. (I draw a barbed wire barrier ahead of this point to remind me that the code above runs in pmode and the code after runs in umode.) Before actually running taskA, replace its pcom regions with ucom_code and ucom_data. The first contains the system service shells that implement SWI system services thus protecting them and their data from taskA. If all has gone well, untrusted code is running in utasks, trusted code is running in ptasks, and you and your boss can sleep well again. Critical parts of the system are strongly isolated from utasks. Though ptasks provide less security than utasks, they are convenient stepping stones to utasks and they provide increased protection for software that must run in privileged mode. 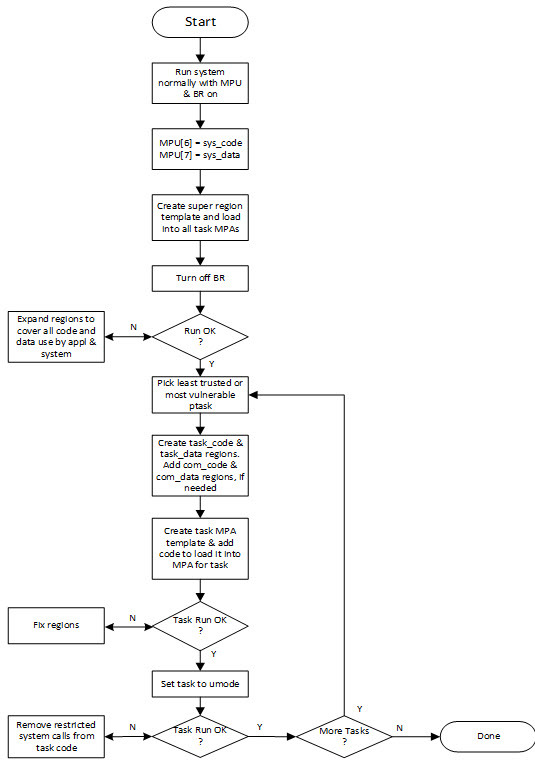 Footnote: For Cortex-M processors the RTOS scheduler runs inside of the PendSV handler. You can't open a newspaper without reading about a computer breech today. We embedded people have a lot of problems we address daily, but security is one too few consider. There's little obvious upside to the boss when asked to spend development dollars to harden a product; the benefits become blindingly clear only after a system is compromised. In an effort to produce more secure devices, developers and development teams tend to put a heavy emphasis on secure coding standards, avoiding inherently unsafe functions, and the use of code profiling tools. But the reality is that even the best written code can pose a security risk if the human-dictated logic behind it is flawed. A good example of this is the D-Link DIR-810L wireless router, which allows any unauthorized individual to wirelessly retrieve the WiFi network encryption key in a matter of seconds! This is a serious security flaw that does not stem from any specific coding vulnerabilities, but rather from flaws in the programmer's logic. To understand this bug it is necessary to understand the two technologies behind it: WPA WiFi encryption and WPS (WiFi Protected Setup). WPA is the de-facto standard for WiFi encryption, and while it has proven itself to be reasonably robust, brute force attacks against the WPA pre-shared key (more commonly referred to as the "WiFi password") are still possible. Although the WiFi password can be made reasonably long and complex, most end users can't remember long, complex passwords, so they choose shorter, more predictable passwords, which in turn are easier to brute force. To address this problem, the WiFi Alliance developed the WPS protocol, which provides a mechanism for WiFi access points to distribute the WPA pre-shared key to authorized devices. This way, humans don't need to ever remember the key, and it can be made very long and complex. The details of how WPS works is outside the scope of this article, and there are actually several different mechanisms through which WPA keys may be distributed to authorized devices. What is important to know is that every SOHO WiFi router has an 8 digit WPS pin assigned to it at the factory, and the WiFi router will give literally anyone your WiFi password provided that they can prove knowledge of this 8 digit pin. Suffice to say, keeping this pin number a secret from unauthorized individuals is paramount for your network's security! 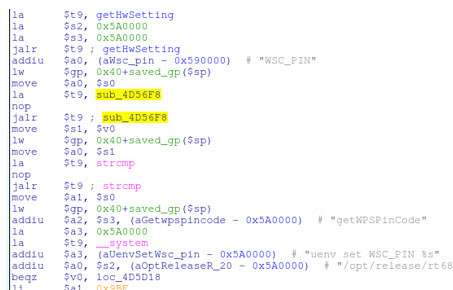 This raises an interesting question for attackers: can this 8 digit pin be easily guessed, or even better, derived from some predictable data (note that most brute force attacks against WPS have been largely mitigated for several years now)? The answer for the DIR-810L - as well as many other D-Link WiFi routers - is yes. 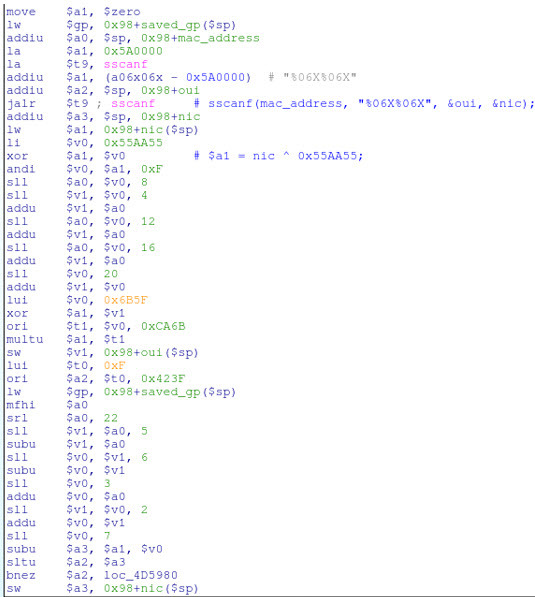 I've manually converted the first few blocks of assembly in IDA Pro into pseudo-C code and added some comments for better readability. 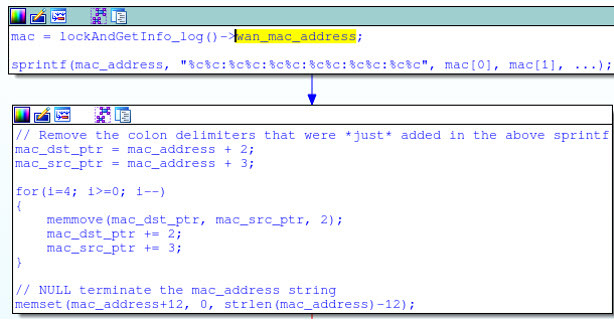 It should be clear that the MAC address of the router's WAN interface is being used by this function, which suggests that the MAC address may be used to derive the WPS pin. This is bad because MAC addresses are not encrypted over WiFi! What's more, MAC addresses are assigned sequentially by manufacturers, so the WiFi MAC address (aka, the BSSID) is typically only off-by-one from the WAN MAC address. This means that any unauthorized wireless user can passively capture the WiFi MAC address, and easily predict the WAN MAC address. Likewise, most multiplication and modulus operations are also performed by various sequences of shifts, additions, and subtractions. This tedium is the plight of the reverse engineer, but its rewards are well worth the effort. There are a variety of readily available, open source tools to perform packet captures and send WPS requests, all of which are part of any standard "hacker toolkit". But the DIR-810L isn't the only device to use this algorithm. In fact, it has been confirmed in no fewer than 22 different D-Link router models, dating all the way back to 2007 when WPS was first publicly introduced. The sad reality is that the secure solution to this would have been considerably simpler: just generate a pseudo random WPS pin for each device! The rand() function is not difficult to use. There should be no reason to use predictable input data to generate pins or passwords of this nature. To some, I'm sure this example will seem like an obvious failure on the part of D-Link's development team. But stop and think for a moment about how many different protocols and interdependent technologies are being constantly pushed into new products, particularly networked and IoT devices. How many of your developers are familiar with WPS? How many know how WPA works, and what gets encrypted and what doesn't? How many know how MAC addresses are assigned at the factory? And how many people in your development team are concerned about any of that in their push to get a product to market? The NY Times has an interesting article (sorry - it may be paywalled) about how to hire an employee; smart people looking for work might get some good ideas about how to approach an interview. Then your situation's hopeless, and your system gonna crash! You can't say this? What a shame sir! We'll find you Another game sir.